Most likely Hawthorn (VFL) Thirds (under-19’s) team. Possibly Hawthorn (VFL) Fourths. Taken at a near deserted Glenferrie Oval with the modernist (Art deco) grandstand in the background. Circa late forties. Twenty players - therefore after 1946. Players are wearing brown jumper with the gold ‘V’ - therefore before 1950 and the Hawthorn club’s adoption of vertical stripes. Jumpers not uniform. White shorts. Slight emulsion damage but no faces obscured. 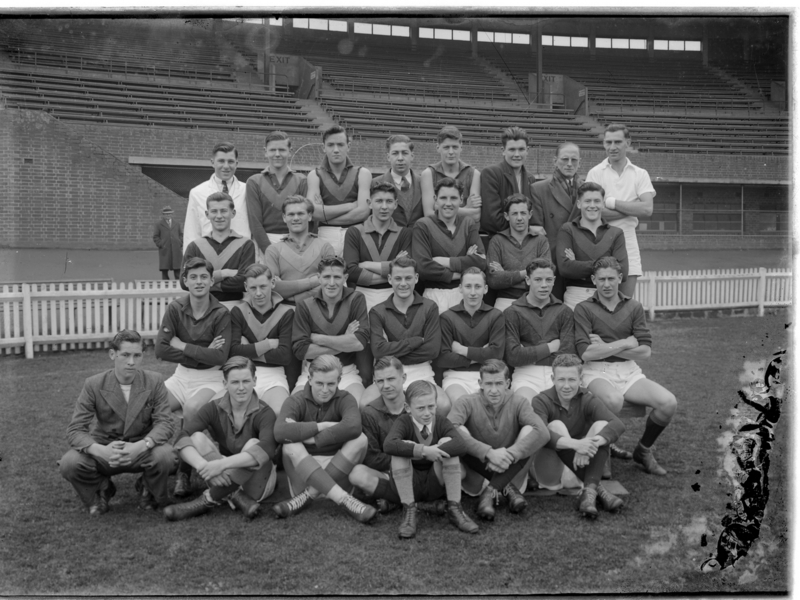 This is the same group as seen in 122_136 - Probably Hawthorn Thirds, Circa late forties v2 and 122_062 - Hawthorn Thirds or Fourths, circa late forties early fifties v1. The only difference in the two photos is the result of some slight movement among the personnel.